This is an integrated top rack with small pannier brackets designed to carry up to 40 lbs / 18 kg of load securely with out damaging the subframe. This is due to the unique design of the rack. Made of welded .75 inch /19 mm diameter steel tube powdercoated satin black. This rack is designed to be used with the 300170 Mini Panniers to carry up to 30 liters of gear PLUS RotoPax cans for water & fuel. It attaches to the frame at existing bolt points. Installation hardware and instructions are supplied. As of 22 July 2014 this rack has integrated attach points for the RotoPax mounts. This means you do not need the 300169 Top Plate for attachment of RotoPax. Weight of rack = 5 lbs. Install time 20 minutes. 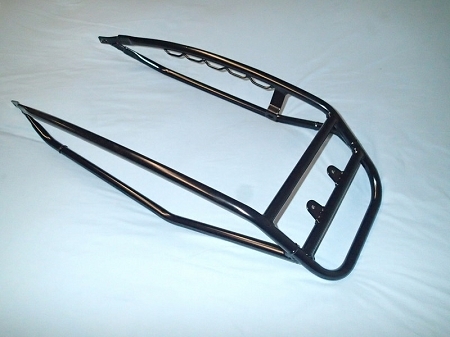 This rack will fit the following KTM models of 250 cc and up from 2008 to present.. Note - A small cutout in rear fender is required for attachment on 2008 - 2011 models. If you have application questions, call us or check the KTM fiche for the subframe on your model. Great rack - only 5lbs! This rack is ingeniously designed. Takes a wreck, preserves your sub frame, and weighs only 5lbs. I double checked on my scale. I used to attach items right to the subframe frame but now I only use this. It looks so good and weighs so little that I leave it on all the time. That said, taking it off and on in 5 minutes is correct. I drilled a hole into my 2010 rear fender to make it fit but it still looks clean and functions great. Highly recommended. Bought the "mini top rack" for my 2014 KTM 350EXC. Excellent choice as it has carried full camping dual-sport gear for the 600 mile Washington Back Country Discovery and for a 2,500mi Ut/Co/Wy back country trip. Overall I think I will like this rack because it fits my KTM in a way that allows it to be used with a simple tail bag or in combination with my Dry-Spec duffel and Saddle Bags. However, the bolts supplied with the mini rack are junk! They new bolts supplied with the rack are stainless steel Allen-Head bolts and are to replace the KTM's Lower Subframe much superior high strength alloy Torx heads. Bad stuff and I will replace What I like: * Compact size * Weighs just 5 lbs * Design is well integrated to bike What I don;t like: * The supplied Bolts are junk I'll update this in a month or two with some input on it's durability.